For my little guys first day back to school I wanted to treat him to a new cake! I have been craving some poppy seed so I decided on making an easy lemon poppy seed cake. I started with Pamela’s Vanilla Cake Mix and added some lemon flavors, and of course poppy seeds! 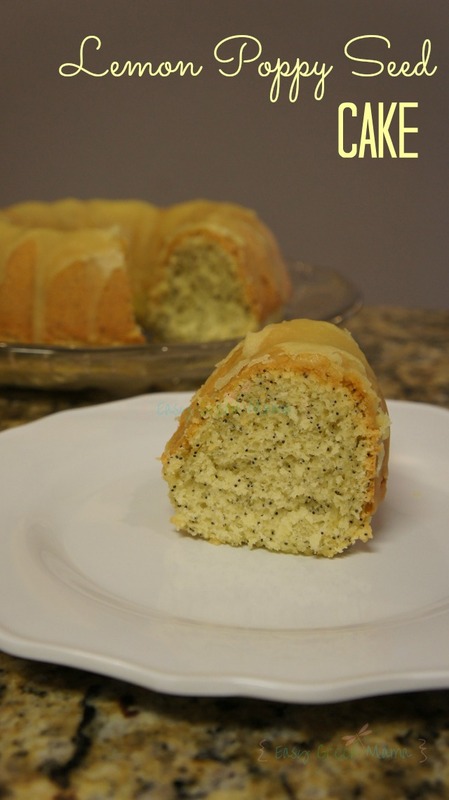 This easy recipe uses a vanilla cake mix to make a delicious and moist lemon poppy seed cake! Soak poppy seeds in 1/2 cup of water for 30 minutes. Grease with butter and flour dust pan (I used bundt pan). *Optional* add food color if you like your lemon cake to be really yellow. Bake for 35-45 minutes or until a toothpick comes out clean. I don’t buy any mixes (not in the budget), so can you tell me approx how much of my own mix I would use in place of Pamela’s cake mix?? Also, does the mix contain baking powder, baking sod, guar, xanthan, etc.?? Thank you! 21oz mix. Ingredients: Organic Natural Evaporated Cane Sugar, Tapioca Starch, White Rice Flour, Potato Starch, Inulin, Sea Salt, Grainless & Aluminum Free Baking Powder (Sodium Bicarbonate, Sodium Acid Pyrophosphate, Potato Starch), Organic Vanilla Powder (contains corn derivative), Rice Bran, Gluten-free Natural Vanilla Powder (contains corn derivative), Xanthan Gum. Hope this helps! Whoops, meant baking SODA, not sod! TY so much for the info!! I went out last night & bought a Bundt pan for this recipe (& one chocolate one I saw on another site). I will LYK how it turns out w/a home mixed GF flour mix, rather than a store cake mix. I am excited about this one! If I can actually succeed at making a giant donut looking cake, my kids will think I am a genius… and hopefully my taste buds agree! I made this cake using a homemade mix & it was pretty good… note to self… would have been better had I not used a flax egg to add moisture & elasticity (doh!). I am going to make it again w/no flax egg & will LYK how it goes. I suspect sheer deliciousness!! I am quite the popular one around here now that I made a giant donut :). I am seriously drooling!! Thanks for linking up at GFF! I have this tweeted and pinned! We made the cake again w/a flax egg, but we used a different cake mix recipe for the cake mix ingredients (apparently my kitchen helper added applesauce to the recipe, which made it way too moist last time), & it was FANTASTIC!! And I am the coolest mama ever… LOL. SUPER delicious! Really light and fluffy and great flavor. My first GF baking grand slam! I used Wegman’s Gluten Free Vanilla Cake Mix and it was perfection! Second time around (less than a week later – that’s how yummy it was!) I did a double batch and made cupcakes. No changes other than bake time and they were outstanding. Next time I’d fill the liners almost to the top as they don’t rise much. THANK YOU THANK YOU for a fab recipe that my husband with Celiac’s can enjoy! Ooooh am I a sucker for lemon poppyseed cake!! And gluten free to top it off means I can bring it to almost any family affair and please everyone!! THis looks like a great cake for summer. So delicious and refreshing. I would love to try this. I don’t avoid gluten but I have found out I love some gluten free flour mixes – this looks wonderful! Made again, this time a double batch subbing half applesauce for oil. Made it a little more ‘muffin-y’. Surprisingly 2 Wegmans GF vanilla cake mixes only made about 24 cupcakes! I also only used 2 eggs for each box (the recipe on the box calls for 1, and since this recipe/Pamela’s calls for 3 I split the difference). A huge hit as always!